Lead boxes were once the king of marketing in the health club industry. Although not as effective today, they should still be utilized. “We’re sorry you didn’t win the grand prize, but we would like to offer you a consolation prize of a free two-week membership.” Does that sound familiar? If you were a gym owner at any point over the past 20 years, you have either seen this method used or have used it yourself. There is a reason it was used as the main form of marketing for health clubs … it worked! And, to some degree, it still works today. There are a number of reasons that lead boxes lost their popularity and effectiveness. First, consumers have become wise to this strategy. About 10 years ago, pretty much anyone would enter their name and phone number into a drawing. Now they know good and well that they will not win the grand prize, and instead will have some smarmy salesperson calling their house or cell phone trying to convince them to buy something. Too many people have telemarketers calling their homes and the last thing they want is someone else calling to interrupt dinner. Also, other businesses began overusing this method. Hair and tanning salons, chiropractors and others began taking up counter space at local retailers, thus creating more noise and less attention to the health club lead boxes. In addition, the clutter on the retailer’s countertop has caused them to begin refusing any and all soliciting businesses to place anything at their location. Not because they don’t want to partner with your gym, but because if they let one business do it, they would have to let all businesses do it. Should you use Lead boxes? The ultimate question is, do lead boxes still work? The answer is yes; they do work … but not as well as they did in the past. There are a few things to consider to ensure they are as effective as possible. 1. Are you in a rural area? Lead boxes tend to work best in rural areas. In larger metro areas, you will find that many of the people who would enter a lead slip live too far away and would pass half a dozen fitness centers to get to yours. In rural areas, people have no choice but to shop near where they work and/or live, but in larger cities that is not the case. 3. 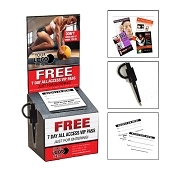 Put your gym’s lead boxes in businesses that cater to your target audience. Don’t put them in the budget hair salon if your club caters to a more upscale clientele. Likewise, if your gym is older and has the lowest rates in town, don’t try putting your lead box at a Ruth’s Chris Steakhouse. 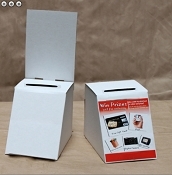 Follow these rules and you will find that lead boxes can still be highly effective. Curtis Mock is the host of FitBiz.tv, the TV show for fitness entrepreneurs and is the executive director of GymSuccess.com. Curtis can be contacted via email at curtis@clubsolutionsmagazine.com.